Joan Chittister, one of our leading inspirational writers, invites us to embrace and celebrate the deep bond between humans and animals. 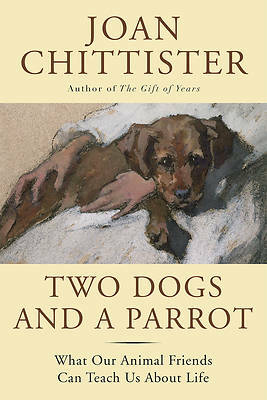 'Two Dogs and a Parrot' offers both heart-warming stories and thought-provoking reflections about sharing life with an animal companion. The relationships we form with animals--with dogs, cats, horses, birds, rabbits, and other pets--are full of joys and rewards. Our companion animals draw us out of ourselves and show us what it truly means to be alive. They teach us to accept life's struggles and to cherish its pleasures and the importance of being able to accept ourselves and respect others. They help us to find purpose and meaning in what we do, and to overcome challenges and setbacks. In our treasured animals we observe varying degrees of excitement and play, of love and fear. And we realize their beautiful uniqueness, their sensitivities and strong sense of purpose.